Of course, the first thing I'm gonna recommend is creating a bullet journal. In short, it's a notebook that you can use as a planner, a journal, for random lists, or really anything else - including many of the things that I'm including in this post. If you want to learn more about it, then I suggest checking out the official website for the basics or some of my posts about bullet journaling for additional information. There are a few people with bullet journals that enjoy using a separate notebook for their long-term collections, such as big goals or plans for the far, far future. This could also include things like big yearly calendars, yearly tracker, etc. This is because most people go through around 2-4 bullet journals in a year, so keeping the long-term spreads in a separate notebook prevents the need for setting up those spreads over and over again. In addition to goals in a long-term collections journal, some people like to use a notebook just for weekly or monthly goals that are created periodically. They make these things specific, actionable tasks - like "finish kitchen remodeling" or "complete first draft of essay" - so that at the end of the week/month, they can check off what they ended up actually accomplishing. Another companion journal that some bullet journalists use is a pocket notebook for on the go. This is where people write shopping lists or errands so they can have all that sort of stuff with them when they go out without having to bring their entire bujo with them. A specific type of themed journal that seems to be popular is those "one/some line(s) a day" ones. Essentially, you write one (or several) lines every day for several years, but a lot of the times for ones that span several years (like those "line a day for five year" sort of notebooks), you write all of the things for the same day on one page throughout the years. For example, the entries for 9/01/2017, 9/01/2018, 9/01/2019, etc. would all be one page. However, for most conventional notebooks, you would probably have to dedicate each page to two different days in order to have all 365/366 days of the year fit if you want to use this method and have the one notebook last for several years. This is overall a fun way of memory-keeping if you write a small summary or something interesting that happened that day, but this would especially be great for when you're entering a new phase of your life - like if you're becoming a parent, moving to a different place, beginning to live on your own, starting university, or anything else along those lines. Another sort of themed journal you can have is a book of baby memories. Here, you would journal - or maybe even scrapbook - things like when and where your baby was born, how heavy and tall they were when they were born, how much they grow each month, when they first start teething, when they start crawling and walking, what their first word is, etc. I saw this awesome post on the internet where a high school graduation gift from a grandpa to his granddaughter was all of the journaling he did after every single time he visited her or spent any sort of time with her. This is such a cute idea, and you could also do it with a niece/nephew, a godchild or someone else like that. Something I do is a "memory journal". I'm currently in high school, and since freshman year, I try to have as many of my school friends write in my memory journal at the end of the school year. Instead of a yearbook where people generally only sign their name and maybe or a very short message, I encourage my friends to write something longer in my memory journal. I tell them to write as little or as much as they want to, but if they ask, I give them the general guideline of writing one paragraph. Not only is this cheaper than getting a yearbook (which I think are $40 at my school), it's also much more personal. If I'm bored, I like to flip through it and see all of the things that my friends wrote. I get to see the ways in that I've impacted their lives (or ways they've impacted mine), inside jokes, or just random, silly things that make me happy to see. Another way of memory-keeping would be by maintaining a "current favorites" notebook. Here, you would routinely and periodically record your favorites from different categories - like music, TV shows, books, podcasts, hobbies, or whatever defines different stages of your life. I recommend updating it monthly (or maybe even bi-weekly if you so desire). Dreams can be a window into your subconscious, so sometimes, interpreting them can reveal how things are you affecting you mentally and emotionally. Plus, they can often be pretty entertaining and make good stories. Recording your dreams in a dedicated dream journal can be a good way to both get them all down on paper and also to analyze them. If you do this, I suggest keeping it at your bedside along with a writing utensil since the majority of what happens in your dreams are forgotten within several minutes. A method of improving your mental health is by keeping a gratitude journal. You want to at least try to put a minimum of one thing every day, even if it's something as small or stupid like "the internet connection at work worked perfectly today" or "my favorite YouTuber released a new video". Having something that you are consciously grateful for every single day can improve your mindset - like "Hey, even if things are absolute crap, there are still good things going on in my life!" In a similar vein, having a journal where you write a daily small win - basically, things that you've accomplished that day, even if it may seem like a given task that you should be doing anyway (such as doing laundry, vacuuming, finishing all of your homework, etc.) - can boost your mental health. This is something that is sometimes suggested by therapists to people who have depression and have zero motivation to do anything. Thus, writing down even the "small" things that you get down can be super motivating and help you on your way to being the best version of yourself that you can be. In this case, I'm using diary as a word to describe a personal notebook where you record the day's events and your thoughts and feelings with pretty much just words (though you can refer to it as a "journal" if diary is too infantile for you). Being able to put your brain down onto paper can be emotionally cathartic, and it can also be a way to record the things going on in your life for memory-keeping purposes. I don't know if there's a better name for this, but something I think is super fun is a friend journal. Essentially, a you and a few of your close friends share one journal, where each friend gets to keep the journal for a certain amount of time (it could be anywhere from a couple of days to a couple of weeks), and it rotates throughout the friend group. It can be such a personal way to connect with your friends, and this would especially be a great thing to do if your friend group is scattered throughout the country - or even the world. You can also keep a separate journal for your travels. Along with simply writing down your daily events, you can also scrapbook things like photographs, tickets, brochures, and other memorabilia. Washi tape is an easy and pretty way to attach these things to the pages of your notebook. Some people like to keep a vent journal that's separate from all of the rest of their writing. That way, negativity can be kept away from everything else. You can use a vent journal to put mouth diarrhea down - things that you need to get out of your system but don't want to put anywhere else. Consequently, you can calm yourself down without saying something that you might regret. I've even seen a person that uses invisible ink in their vent journals. If you're trying to learn a new skill (or improve an already existing one), keeping a practice log would be helpful. In addition to quantitative data - like how long you practiced for and on what day, you can also include things like what specific stuff you did, your goals for whatever it is that you're trying to accomplish, etc. If you're trying to become healthier, keeping a fitness journal of your physical health would certainly be beneficial. In it you could track your exercise, physical measurements (like weight or body fat), workout stats (such as how much you can bench and other stuff like that), daily caloric intake, healthy meal ideas, or anything else that would be helpful for you. If this is something that you enjoy keeping track of, you can create a reviews journal; reviews could be of books, movies, music, TV shows, soundtracks of musicals, art supplies, or whatever else. In addition to the reviews themselves, you could also include spreads like a table of contents and your to be read/watched/listened/etc. list. If you're on this blog, you're probably like me and own a large amount of stationery When you own such a collection, it can be easy to not use the things you have simply because you forgot you had it. Or, you may accidentally buy duplicates of an item for the same reason. Having a notebook where you swatch all of your stationery - including pens, fountain pen inks, markers, washi tape, etc. - can be useful. Along with the actual swatch and product name itself, you might also want to write down when and where you purchased it and how much it cost. If you're trying to improve your handwriting, you might want to have a notebook dedicated to practice. French ruled paper would be particularly helpful since it has more precise guidelines within each line, which can really help you nail down the specific forms of each letter. Along the same vein, if you want to learn calligraphy, keeping a hand-lettering "sketchbook" can be nice - both for practicing and a way to document your progress. An empty notebook with blank (or grid) pages could serve well as a sketchbook. Even if you can't draw/paint/whatever, keeping a sketchbook is a good way to practice; after all, visual art is a skill just like any other that must be developed through practice. Regardless, unless you're only using pencil, make sure that the pages are thick and non-porous enough to withstand your medium of choice. If you're an artist, keeping a notebook of drawing references can be super helpful. In here, you could draw guides to things like basic anatomy, different hand and body positions, different facial expressions, and more. That way, you can easily reference the sorts of things that can often give you trouble when it comes to drawing. Here's a video all about the topic. Art journaling is an interesting combination of a sketchbook and a diary, where there are both illustrations and writing. It can be a fun way of both being creative with your art and your words, and it also lends itself well to using washi tape, stickers, etc. Some people, when creating original literature (such as a novel or collection of poetry), enjoy writing everything out by hand first. You can dedicate a notebook to this, especially if you're wanting to participate in NaNoWriMo. I have a song journal that includes a variety of songwriting and music stuff - specifically singing & accompanying myself on guitar/piano/ukulele type of stuff. I have chords and lyrics for my original songs plus a few non-originals, chords for songs that I can cover, resources on writing original music, and other spreads like these. This is especially great for if you are doing some sort of performance, since all of the information you need is together in one place. You can collect quotes that you enjoy all in one journal - whether it be motivational quotes to help you get through hard times, your favorite song lyrics, quotes from literature that you read, funny and random things that your friends say, etc. This might be a risky thing to have, but keeping a notebook full of your passwords might be beneficial for you if your memory is not the greatest - or if you're one of those weird people that actually uses a distinct password for every single website. However, I would warn against having something super obvious like "PASSWORDS" on the cover or the first page. Obviously, just be careful with this notebook, and make sure to keep it in a more discreet location in your home. If you calculate your monthly income along with all of your expenses throughout the month, you can create a budget in a notebook. This can be especially helpful if do various money-related things throughout various different accounts, so you can keep track of all of your finances combined together in one place. Plus, if you use fun colors and make it look cute, it'll encourage you to be more financially responsible and conscious about your money. Keeping your recipes in a journal is not only a good idea to prevent yourself from forgetting them, it could also serve as a nice gift to your children/grandchildren/godchildren/other relatives. I suggest keeping a color code where one color is for breakfast foods, one is for lunch, etc. and using a marker of that color to mark the edge of the page. For ultra organization, you can even reserve a certain spot on the edge of the page for each individual color. Check out this video by Boho Berry to see what I'm trying to say. 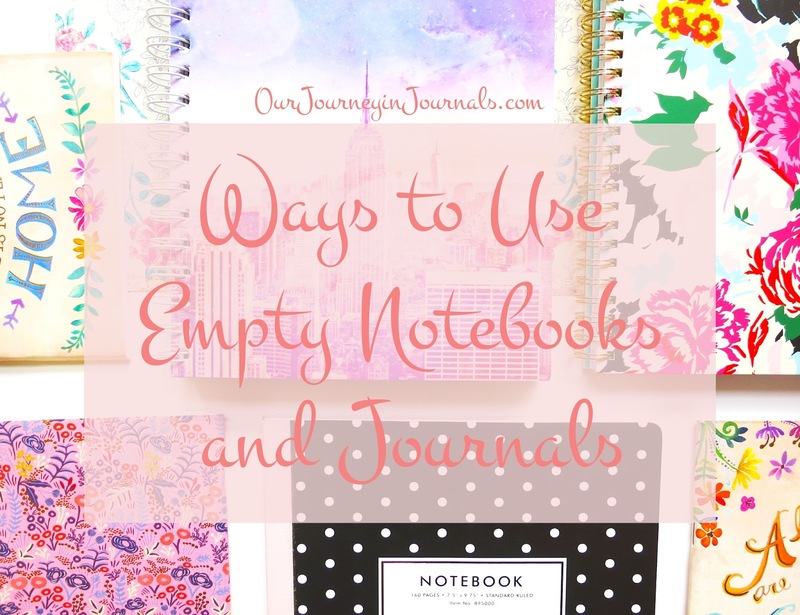 Lastly, you can use empty notebooks and journals for notes - whether they're for school, personal learning, work meetings, or whatever. I suggest creating a table of contents on the first couple of pages (I usually use two pages, i.e. one sheet, front and back) and number the notebook or journal's pages to make it easier to find all of your individual notes quickly. So, those were some ideas on ways to use empty notebooks! I hope that I've helped you in some way to actually use all of those really pretty journals that you have. Of course, this isn't a completely exhaustive list; I've definitely missed some ideas that could be useful for some people. Make sure to leave the ones you know of in a comment down below! You have listed a lot of great ideas for all the notebooks I have sitting around the house! Love this post! Thanks so much for compiling this awesome list :-) Loving your blog too, btw! husband wife problem solutions Good blog post. I want to thank you for interesting and helpful information and I like your point of view. Thank you!